France's first international news channel has been launched into competition with BBC World and CNN. 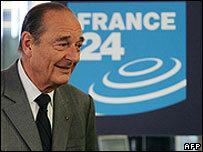 France 24 was unveiled on the internet on Wednesday evening, and will launch on satellite and cable TV 24 hours later. The channel has the backing of French President Jacques Chirac, who despaired at the lack of an outlet for French views in the run up to war in Iraq. But some critics have complained it has insufficient funding to compete. The network has a budget of 86m euros (£58m) a year. That compares with 900m euros for CNN. France 24's 170 journalists will be spread across two parallel services in French and English. Later it will add Spanish and Arabic broadcasts. Some experts have said this will leave it stretched. It will be able to call on correspondents from private channel TF1 and state-owned France Televisions channels, which will jointly run France 24, but there have been concerns that it is not clear who will take priority. The fanfare leading up to the launch included full-page advertisements in French newspapers Le Parisien and Le Figaro on Wednesday, alongside the channel's slogan: "All the news you're not supposed to know." The running order was said to include an interview with President Chirac. The president visited the station's newsroom ahead of the launch. France 24's journalists have signed a mission statement "to cover international news with a French perspective... and to carry the values of France throughout the world". But the channel insists it is independent and will not just follow the government line. "Our mission is to cover worldwide news with French eyes," said the channel's head, Alain de Pouzilhac.